Modernize your moka with the DeLonghi Alicia Electric Moka Pot. You'll get the same rich, thick cup without the need for a hot-plate or stove. Equipped with an auto-off to prevent over-extraction and a basket splitter for half-pots, the Alicia is just the thing for dorm rooms and office spaces. Auto-off - The Alicia shuts off one brewing is done, or when removed from its base. Clear Reservoir - A clear plastic reservoir shows off the Alicia's brew cycle and makes for an entertaining end to the brew process. 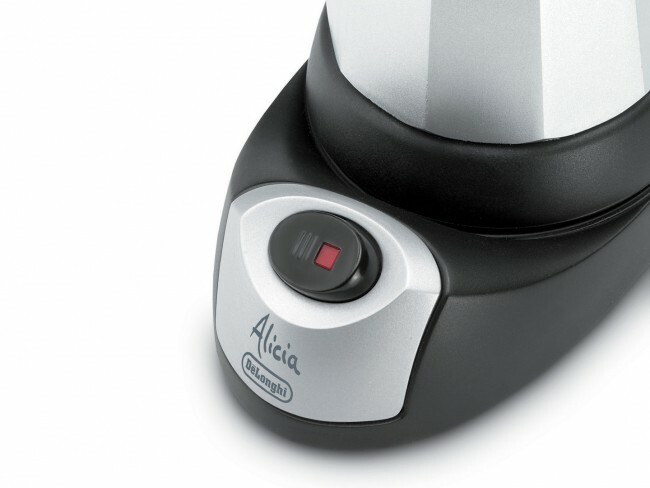 Keep Warm - The Alicia keeps your coffee warm for up to 30 minutes after the brew cycle is complete. Split Basket - An insert lets you brew a 3-cup half basket. 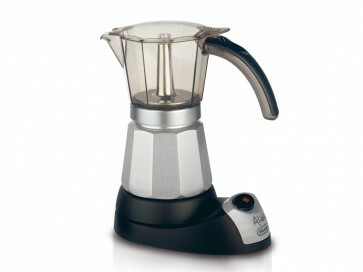 Modern Moka - An excellent choice for moka pot lovers who don't have access to a stove! Perfect for an at-work or dorm room setup. Heat Management - The auto-shutoff of the heating element prevents your Moka from over-extracting, a common problem with stovetop coffeemakers. Plastic Reservoir - While it's nice to see your brew through the smoky plastic, we can't imagine this plastic piece will last as long as its aluminum-equipped counterparts. Rinse coffee carafe and lid after each use. When unplugged and not in use, wipe the base and boiler with a damp cloth.